To celebrate my acceptance into UWashington’s Data Science Certificate program, I decided to brush up on my F# skills and apply it to multiple studies of Exoplanets. Through this blogpost, I plan to highlight how I acquired and persisted the Exoplanetary and Stellar data via MLab and MongoDb. Additionally, I describe the first study I carried out with this data that included generating basic descriptive statistics of the Exoplanetary Mass using MathNet.Numerics and creating some plots based on the data via XPlot.GoogleCharts. Our data is acquired from the catalog offered from Exoplanet.eu available here in CSV form. We make use of the CSV type provider in the following manner to get the collection of exoplanets. Our downloaded CSV has many columns and a lot of rows all pertinent to Exoplanetary and Stellar data. Our first step is to sieve out exactly the columns we want to use for our studies. To be as scientifically close as possible, we employ the use of an awesome feature built in to the F# language called Units of Measure; more information of which can be found here. In a nutshell, these provide an extra layer of type safety only allowing similar units to be mathematically combined. Ugh, we see a bunch of nans indicating the data simply doesn’t exist from the catalog. Turns out if we sieve the nans, we are left with almost no data; we’ll leave them in and selectively filter out the nan records in accordance to which field we consider in our study. We’ll use MLab for our MongoDb storage needs. Our first step is to create a database for our planetary studies. That can be done easily by choosing “Create New” on the MLab home screen after setting up an account. We’ll name the database “astrosharp” in the free tier with the appropriate fields based on your location. 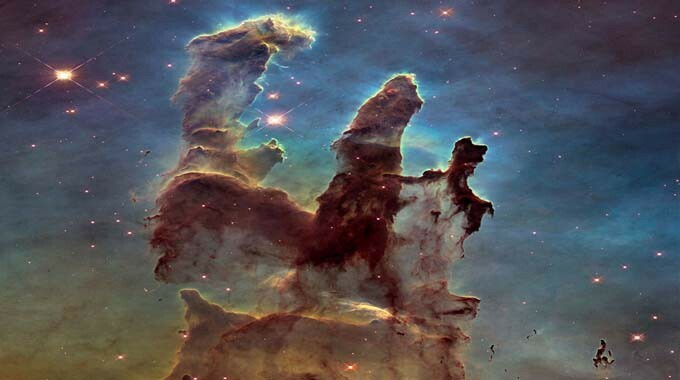 Subsequently, we create a new collection called “Exoplanets” and add a new Database user with password; this will give us all the information needed for our connection string. Once our data has been successfully persisted, we want to be able to create cleaned data sets that we’ll run some descriptive statistical methods on and generate some plots. In addition to getting these descriptive statistics, we want a way to visualize our results for which we’ll be using XPlot.GoogleCharts. To compare different masses with that of Earth, we add a new unit of measure called EarthMass and provide a conversion function. As mentioned before, we want to get rid of the pesky nan masses littered across our dataset for both the exoplanet and its corresponding star. We generate our descriptive statistics by defining a function that gets these statistics based on the mass called computeDescriptiveStatisticsForMass. 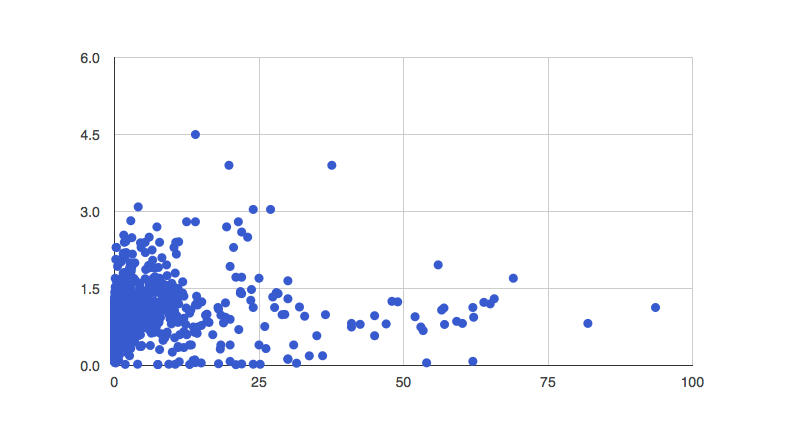 It’s evident from the difference between Median and Mean that there are a considerable number of outliers and therefore the distribution is far from a bell curve. 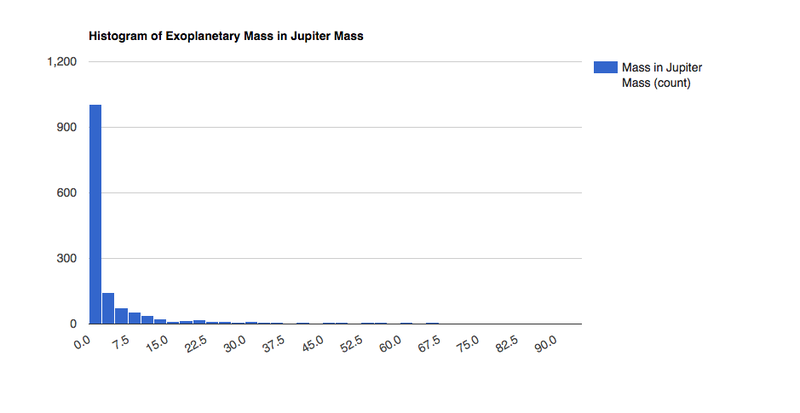 Let’s first take a look at the frequencies of the Exoplanetary masses using a histogram. Dat Skew. The distributional frequency is positively skewed implying that there are a lot more exoplanets in this catalog who mass is close to that of Jupiter. 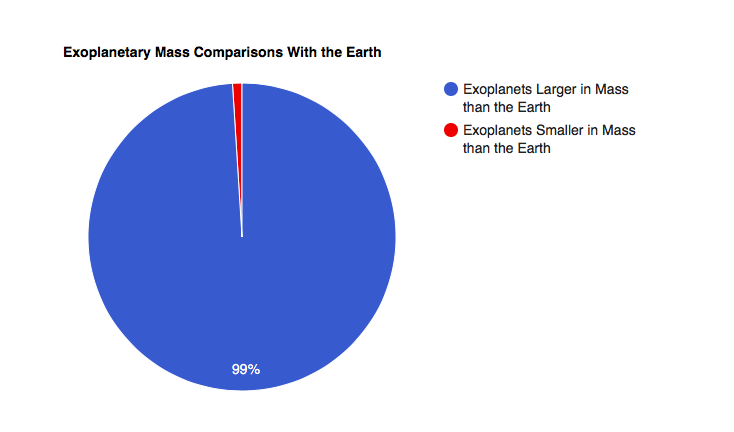 Next, let’s compare the mass of the Earth to the that of the parents via a Pie Chart indicating how many planets are greater than in mass to that of the Earth. Woah dude, according to this catalog there are a lot more planets out there with larger masses than the Earth! Let’s create a scatter plot of the Stellar Mass in Solar Mass on the Y axis and Exoplanetary mass in Jupiter Mass on the X Axis. Pretty interesting that a majority of the data points stay very close to the origin. Additionally, It’s rare to find an ultra massive star for large planets [ ??? might need some Physics here to prove this thoroughly ]. Through this blogpost, we were able to use MongoDb to save Exoplanetary data and use some basic statistical analysis to create a study on the mass of Exoplanets. It’s definitely fun to try to come up with observational theories about the data despite operating on a sample set.